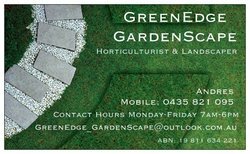 Small Horticulturist and Landscalping Business. Proving best services as i take pride in my work but also i love my job. Being a Horticulturist and Landscaper makes a brilliant combo as i will also be able to provide advice on your plants, pest , diseases ect. Looking to make a good name for this business so i will always ensure jobs are well done!